She came to me because she was feeling frustrated. She had this dream she’d been carrying for years but had never done anything with it. We talked some more about her dream and what she wanted to do. I knew she kept a journal, so I asked her what had she learned from her journal about her dream and why she was not pursuing it. She looked at me surprised and responded, “To be honest I don’t journal about it.” She seemed perplexed and taken aback by her own words. Journaling was something she had done for many years. It was where she went when life was hard and did not make sense. And yet even though she was experiencing deep frustration and a sense that there was more she should be doing with her life, she did not think to write about it. When you journal it forces you to confront yourself in an honest way. I think for her, she had not taken the time to journal about her dream because she knew once she was writing about the thoughts and feelings associated with her dream, it would demand more of her. It would become a dream that was not only spoken aloud but written, requiring her to do something about it. Dream making is always about knowing and doing. The dream will never leave you alone. Once you know it belongs to you, you have to take action and start living it. 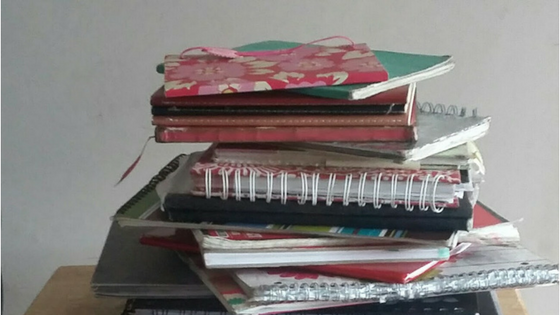 We talked a little while longer about the power of journal writing and how it could help her start moving towards her dreams. We shared examples of how writing had helped us over the years during different times in our lives. In the end, she left with a recommendation to get out of her head and onto the page. Journal writing is one of the many powerful tools in the Dream Makers arsenal for getting and staying on the path to living your dreams. We think about what we want to do. We fantasize. We have moments where the dream feels possible. But staying in our heads with thoughts swirling about can actually contribute to us never doing the things we think about and want to do. When we put our dreams, goals, intentions down on paper, they become concrete. They no longer reside in our minds as these abstract concepts but instead, become something we can see with our eyes when we look at the page. Writing things down helps to make them real. On the page you can write out what you want to do, the people you need to contact, the things you need to purchase, the date you want to start. Anything and everything related to your dream can be captured in a journal. When you write down your dream in your journal you are able to refer to it often. It becomes a playbook of sorts of what you need to do next. It becomes your portable therapist, a place to write about the feelings that go along with pursuing your dreams. It also becomes a sounding board, where you can write every idea that you have about your dream and then explore each one in depth to determine how viable they may be. Writing your dream is important and life-changing. Here are four powerful journal prompts to help you connect to your dream on paper and determine the actions you need to take. What is it I want? This is a clarity question. It is asking you about the specifics of what your dream is. Write out your dream in vivid, clear details as if it is happening now. Include how you feel, where you are, who is around you and any other details that help to bring your dream to life. Why do I want it? This is your “why” question. The answer to this question is what will motivate you and push you forward especially during times of doubt and fear. It will help to keep you from quitting and giving up. It will also help you combat the dream killers who come along and try to take you off your path. What do I have to do to have it? This question is about the actions are you going to take. It is one thing to think and fantasize about what you want and it is another to act on it. This question will help you to create a clear plan, identifying the different aspects of your dream that will need action steps. When will I start to do it? This is your implementation question. It is the question that requires you to put a date on your dreams. A date of when you will start to move towards what you want. A date of when you want to accomplish certain aspects of your dream, for example, if you want to write a book what would be the timeline for completing your research, writing the first draft, editing, completing the second draft, contacting publishers, etc. Every action step needs a date attached to it. I started out sharing with you about a woman who came to me for some help. When she began to journal about her dream and the feelings surrounding it, she was able to figure out why after 15 years she never pursued it. The writing was cathartic for her because she was able to explore the fears that held her back for so many years. Writing also helped her to get clear about what she wanted and why she wanted it. In the end, she was able to create some initial action steps based on what she discovered about herself and her dream. She also finally started taking the steps to make her dream her reality. What was her dream you ask? She wanted to write a memoir about her life. She survived domestic abuse and wanted to share her story as an inspiration for other women who have been through the same experience. She believed she had an important message to share with women, a message to let them know it was possible to live a happy and healthy life free from abuse. Had she not started journaling, her dream perhaps would have continued to lay dormant. And the women out there in the world who need to hear and read her story would never have the opportunity to receive what she has to offer. What aspect of your dream would benefit from you writing about it in your journal? Post a comment or send me an email I would love to hear from you. Sharing is a good thing! Share wordsbytara.com with someone you know. If you want journal prompts to help discover more about yourself and your dream, make sure you sign up for the wordsbytara.com Weekly. Each month I offer tips, resources and a journal prompt to help you as you pursue your dreams.